"'But the Comforter, which is the Holy Ghost, whom the Father will send in my name, he shall teach you all things, and bring all things to your remembrance, whatsoever I have said unto you. "You will at times have your faith challenged by Satan; it happens to all disciples of Jesus Christ. Your defense against these attacks is to keep the Holy Ghost as your companion. The Spirit will speak peace to your soul. He will urge you forward in faith. And He will bring back the memory of those times when you felt the light and the love of Jesus Christ. "Remembering may be one of the most precious gifts the Spirit can give you. He will “bring all things to your remembrance, whatsoever [the Lord has] said unto you” (John 14:26). The memory may be of an answered prayer, of a priesthood ordinance received, of a confirmation of your testimony, or of a moment when you saw God’s guiding hand in your life." President Eyring's talk at the Women's session of General Conference was tender and reassuring, as he so often is in his remarks. 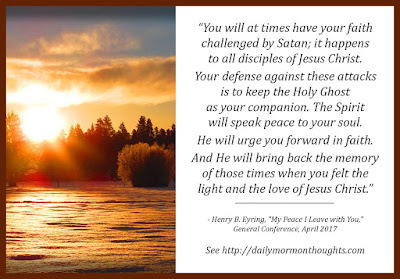 Addressing the challenges and fears that can come to us all in this life, he reassured his listeners that the Lord offers the incomparable gift of peace through the Holy Ghost. 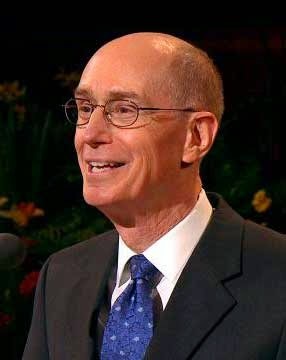 The invitation and challenge President Eyring issues is to "keep the Holy Ghost as your companion." That is the great key to finding and retaining peace. As we live worthy of that gift, then the Lord's promise of His peace can be realized in our lives. The sacred gift of remembrance is to be cherished as well. As we have sacred experiences with the Holy Ghost, they should be noted and "treasured up" so that they can later return to bless us with peace in a time of need.